• Free, small, easy-to-use and highly functional with intuitive interface. • Provides notifications and information on available software update. • Supported by a growing software library. • No personal information leakage. The program automatically scans and lists the programs installed on your Computer and checks for new versions of them by connecting to Glarysoft Software library and offers the links for them if available on its program interface. When software needs to be upgraded displays a simple work. Then, with one click, you can launch an installer to upgrade the software without any further user intervention. Software Update Pro is used by IT professionals to manage software on tens of thousands of machines each month. Updater is based on the same technology the Pro’s use, but packaged in a simple client you can install on a friend’s PC and then forget about. When you have tons of application installed on your PC, it is very inconvenient and difficult to keep them all up to date. It is a time consuming task if done manually. That is why specialized software updater applications exist. These applications can notify you when the updates are available and also help you install them on your PC. 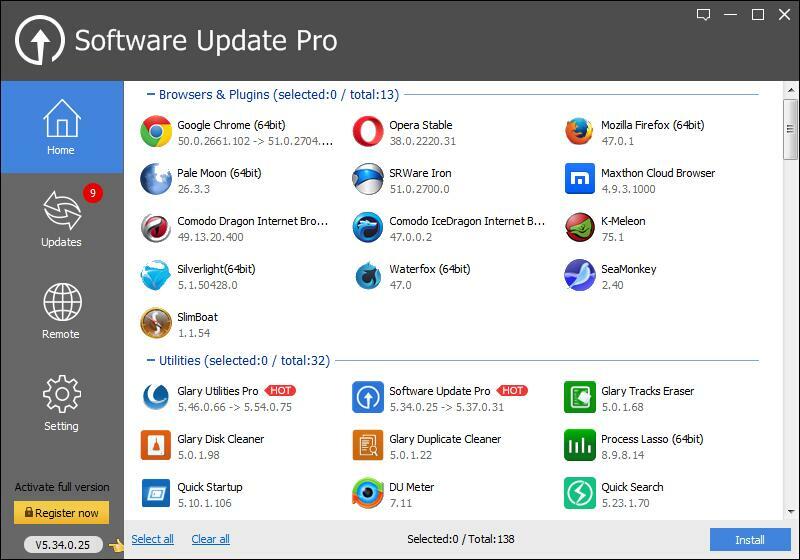 Glarysoft Software Update Pro is a lightweight software application, designed to help you update all your installed application, and save you a lot of time and effort. This application notifies you when the updates are available for any application, and then help you update the applications easily. The installation file is ~7MB in size, so it is easy to download and install. The installation process is simple and straightforward, taking no time at all to complete. Once installed, you can launch the application and activate it using a license key, or you can use the application as 30 days trial license. The application automatically scans and displays a list of all your installed applications, also showing information about their current version, and whether or not they need to be updated. The UI of the application is clean, simple, and has a modern design. The four sections of the application can be accessed from the 4 buttons on the side, namely Home, Updates, Remote, and Setting. The first section shows all the installed applications alongwith their version information, and also shows other useful softwares that users might want to download. The next section shows only the applications that need to be updated and the ones that have been recently updated. The remote management tab let’s you view and manage the application updates of all the PC’s in your network. The setting section let’s you configure and tweak a few option in the application. – Automatically scans and lists all your applications, and offers download for the application that need to be updated. – Notifications about application updates. – Ignore beta version updates. – Can be minimized to system tray, and shows tips when it’s there. – Ignore updates that you do not need. – Change language of the UI. – Remote management enable tech people to update applications on hundreds of PC’s in their network easily and effortlessly. – Application are divided into various relevant categories, making it easy to find a certain application even when you have a lot of them. – Crashes every 10-20 minutes. – The ‘Home’ sections feels like a section to promote other applications, it lists more of the recommended applications than the ones installed on my PC. Glarysoft Software Update Pro is an easy to use application, that can provide a solution to a big issue of updating applications. The application needs more work on it’s stability, as it crashes way too often. Other than that, it works great and is easy to use, with minimal system resource usage.